Icebreaker's highly breathable, comfortable, do-it-all merino wool T-shirt, the Tech Lite Short Sleeve Scoop is a go-to top for four seasons worth of trails, travels, and active pursuits. With capabilities as varied as the adventures you’ll take it on, the Tech Lite features a flattering scoop-neck silhouette as well as their jersey corespun fabric—nylon fibers wrapped in merino wool to provide added strength and durability while maintaining next-to-skin softness. Tech Lite SS Scoop - Stripe- Womens is rated 4.7 out of 5 by 6. Rated 5 out of 5 by NorthernLighter from Marie Kondo made me I got rid of all the t-shirts that didn't fit me, had pit stains, had pit stench or otherwise were being clung to, with a great motivational carrot: I would replace this sad, rag-to-be mass with 3 icebreaker Ts. I measured twice, ordered once. The Ts are comfortable, roomy (not too tight, unlike the skin-fit sprites. A+), and stink free. They look neat, are easily pairable and are quick to wash & dry. My only request is a few more colours, but really - all the wardrobe basics are covered. Rated 5 out of 5 by KelseyH from flattering, comfortable and beautiful I simply love this shirt. The fit is so flattering and the colours are beautiful. 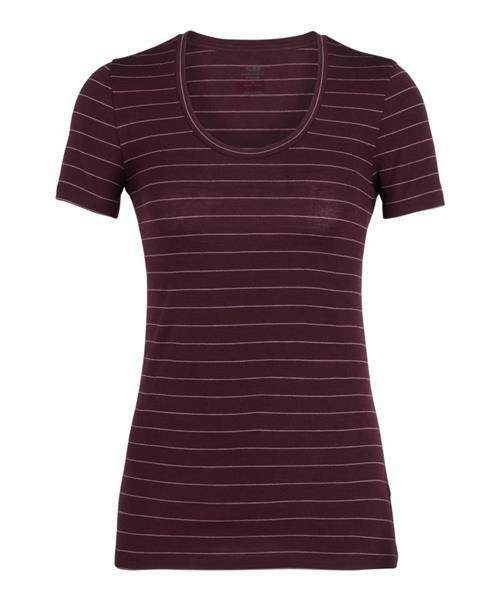 The merino fabric breathes well and resists odours. I also find it is pretty durable. I am 5'5 with a slim/athletic build and the size small fits me absolutely perfectly. This shirt is also very comfortable and material has some stretch to it. I do not normally bother to write reviews for products but I feel that this product deserves it. Highly recommend. Rated 4 out of 5 by Klister from Nice, but thin The top has nice styling, but I find the fabric is too thin. Obviously that would help keep you cool in summer. However, you can see the dark outline of your jeans underneath, more so than with other shirt materials. Rated 4 out of 5 by Kuma from Wife Loves It Wife loves it. She is now a merino convert. She wants to buy more for the summer.